Welcome to Morning Eagle Morning Eagle Aerial View Whitefish Mountain View of the beautiful Morning Eagle condominium Large living room with comfy sofas and door to patio Flat screen TV with open kitchen and living room design Granite counter tops with reading chair and bar stools side by side fridge freezer with large counter tops for cooking Lots of cabinet space with large granite counter tops Luxuriously comfortable Queen size bed Beautiful mountain views right from your bed extra storage with large dresser Bunk room with cozy bunks and a view Beautifully crafted Queen size Montana style log bed Another shot of the beautiful Queen size bed Rustic, cozy queen size bed Large and luxurious bathroom Washer and drier for guest use Exterior shot of the beautiful condominium Communal gym for guest use On sight ski and snowboarding lockers for the ski season Morning Eagle Whitefish, MT Beautiful views of Big Mt from the tub Relaxing communal hot tub Enjoy the many hiking trails on Whitefish Mountain Take a ski lift ride during the summer for amazing views Downtown Whitefish Farmers Market One of the many fun activities to do on Whitefish Mountain during the summer Enjoy the Alpine Slide on Whitefish Mountain Take a fun biking trip on Whitefish Mountain Whitefish City Beach is just a short drive away. 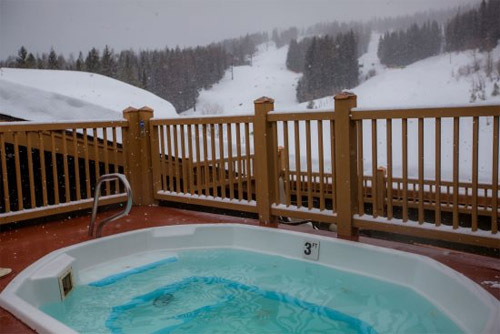 This gorgeous ski-in ski-out unit at Morning Eagle is right on Whitefish Mountain which is one of Montana’s finest ski resorts. Whitefish Resort links you to 3000 acres (98 trails) where you can enjoy some world-class skiing. The resort is well known for a pleasant lack of lift lines as for its consistently good snow conditions, on average 300 inches a year! 1,281 square feet of living space packed with all the comforts of home. Large windows for ample light and there is no extra charge for the fresh mountain air. The floor plan is inviting. Spacious kitchen with a dining room table to accommodate all your guests. Cozy living room with fireplace and large flat screen HD TV. Master Bedroom has a queen-size bed, large closet and an en-suite full bathroom. Bedroom #2 has one bunk bed with one Double-Size bed and one Twin-size bed. Bedroom #3 has a queen-size bed with a spacious closet and en-suite full bathroom. All the bedrooms have luxurious linens. There is a sofa sleeper in the living room for 2 additional sleepers if needed! The unit has a full-size washer and dryer. You owe it to yourself to stay in this perfect ski-in ski-out Big Mountain condo!